This roller set came out so nicely, I had to share it with you guys. I shampooed with Generic Value Products Tea Tree Shampoo. I deep conditioned for 45 minutes with Nexxus Humectress and 2 tsps of castor oil. After rinsing the deep conditioner, I applied Apogee Keratin and Green Tea Restructurizer, Generic Value Products The Conditioner and Proclaim Foaming Wrap Lotion to my hair. Next I roller set my hair using the popular mohawk method. After sitting under the hooded dryer for about an hour, but I wasn’t confident that my hair was dry but it was really late. So, I took a chance and went to sleep with the rollers still in my hair. I thought for sure that it was going to be the worst night’s sleep ever, but it wasn’t too bad. I took my hair down in the morning and created a few pin curls just to gather the curls. Once I finished getting ready, I released the pin curls and sprayed my ends with Sebastian Shaper Plus Holding Spray. I combed through the roots leaving the curls at the ends of my hair undisturbed. (See this video for a visual demonstration). My hair was so soft and bouncy. I loved the results. 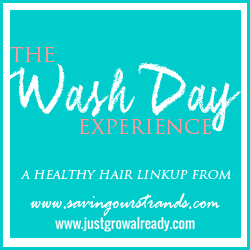 This is also my first wash day experience post. 🙂 I hope I’m doing this right! Your hair looks so great. Very bouncy and i can't imagine how uncomfy your night rest must have been. Welcome to the linkup. Thanks, Tomes! I think I was so tired that the discomfort wasn't enough to wake me, lol. You do the best roller sets you make it look so easy. Always gorgeous and love the makeup too. What is the name/color of your lip gloss? Am definitely going to use your tutorial when I attempt mines! Love the fullness and fluffiness of your hair. Thanks, Ava! The lip gloss is Revlon Colorburst in Sunbaked. Thanks for the welcome, ladies! Sometimes I do two pin curls/bantu knot-esque twists at night to preserve the curliness for another day or two. But it's never as curly and defined as day one. Instead it looks loosely tousled and/or wavy. Loved your results, do you experience breakage upon removing your roller sets ( I do & want to minimize it) and does the Aphogee Keratin and Green Tea Restructurizer leave your hair feeling hard/proteiny? I don't experience breakage when removing the rollers. It could be that you are applying too much of the Aphogee Restructurizer. Because it's a protein leave-in, I always use it with a moisturizing leave-in treatment to avoid hard hair. I hope this helps, mzdann!